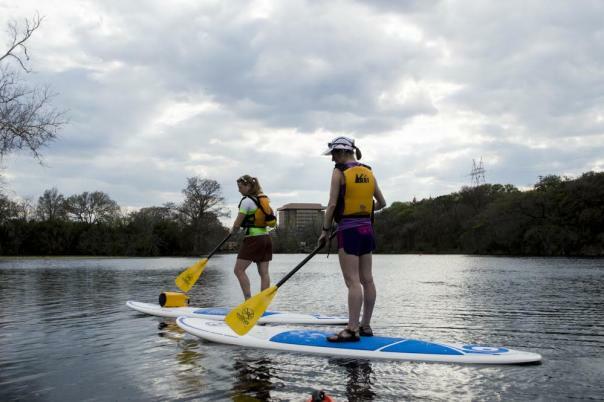 Stand Up Paddling (SUP) has been popular in Austin for several years, but with the steady influx of water sports enthusiasts continuing to swell our city, the sport has recently gained even more steam. Especially since recent storms renewed our drought-stricken waterways, Central Texas, which is already a great flat-water paddling destination is poised to offer unprecedented fun for the established SUP crowd, and anyone just wanting to dip a toe into the sport. The best place to start is at a local outdoor shop; see our list of recommended shops in your area. The people at these stores can get you up and out with all the essential gear and tell you where to go. Check out BIC SUP&apos;s How to SUP for tips and tricks on choosing the right board, different strokes, and just getting started. Your next move is to find a good spot, get out and go for it. Stand Up Paddle Boarding (SUP). Photo courtesy of Roots Rated. Lady Bird Lake is the hub for all sorts of paddle sports, and its popularity among SUPers continues to grow right along with Austins population. Relatively calm waters, great views of the city, easy water entry, and its central location make it by far one of the best spots for paddlers. According to the paddling expert at Austin Canoe and Kayak, Lady Bird Lake is certainly our favorite, offering the best in the middle of it all feeling when paddling. It&apos;s a no-powerboats lake, so it offers the most protection when it comes to rough waters. Whether you buy your own board or rent from one of the docks, Lady Bird Lake is a great place to get your feet wet, especially for first-time SUPers. Formerly known as Aquarena Springs, the site for an old water theme park, Spring Lake in nearby San Marcos provides a truly unique paddling experience because it is literally one of the clearest bodies of water in Texas. And because of its environmental sensitivity, it&apos;s only open to the public through guided paddling tours by REI Austin (both SUP and kayaking are available). From the vantage point of the board, you can really get a full appreciation of how clear this lake really is. It sometimes seems as if you&apos;re paddling over tropical waters off some remote Caribbean island instead of a small lake in the middle of Texas. You&apos;ll see the springs 30 feet down bubbling on the bottom. You&apos;ll see artifacts like the old giant concrete clam shell the mermaid underwater performers used in their shows, and other sights. Another thing that makes Spring Lake so special is its history. In addition to its current protection as a research site for the Meadows Center for Water and the Environment and its recent past as a theme park, findings suggest that this lake has been a water playground for humans in the area for at least the past 12,000 years! So to say the least, a SUP tour of Spring Lake is definitely worth it. SUP on the Lower Colorado River. Photo courtesy of Roots Rated. 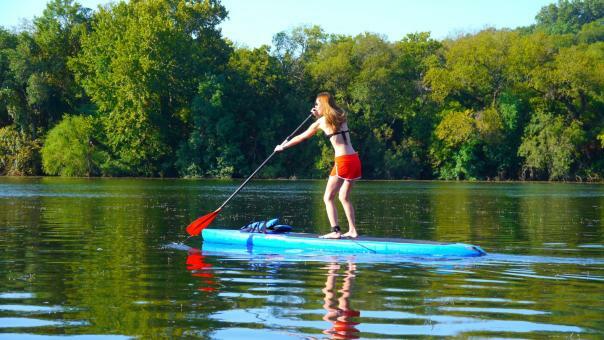 On the Lower Colorado River southeast of Austin, the section between the towns of Bastrop and Smithville is an excellent stretch for SUP. The river here is quiet and its natural state is preserved. The scenery is lush with Central Texas native trees and grasses, which harbor all sorts of wildlife, not to mention the abundant aquatic wildlife. You will often have this stretch all to yourself, so it&apos;s a great reward for a short drive outside of Austin proper. The Bastrop-to-Smithville paddling trail also offers more than one launch-to-exit option, so if you prefer a shorter paddle instead of making the entire section between the two towns, you can do that. Just check out the ramp locations on the paddling maps at each launch site. A lesser-known SUP route, the Narrows, lies in a slightly secluded section of Lake Travis. Located near the town of Spicewood, just west of town, the general area is popular with boaters and other water sports enthusiasts; but because this specific section is so narrow, literally, boat traffic is lighter than other parts of the lake. This keeps the water chop down to manageable levels for SUP. As Austin Canoe and Kayak adds, Anglers enjoy this spot during certain times of the season, but it&apos;s often overlooked by recreational paddlers. Plus, the views are nice and wildlife is abundant. So if you don&apos;t mind driving just 45 minutes out of town, the Narrows serves a nice SUP trail with excellent exposure to one of the Austin areas best water playgrounds. There are more paddling routes around Austin that lend themselves well to SUP, especially now that our creek and river water levels are, for the moment, decent. But with relatively easy access, nearby amenities and overall scenery, the four above strike a nice effort-to-reward balance. Austin Canoe and Kayak, 9705 Burnet Road #102, Atlanta (512) 719-4386 If you are looking to buy a paddleboard be sure to check out these guys. They have a great selection of boards and can help find the one that&apos;s perfect for you. Backwoods Austin, 12921 Hill Country Blvd., Suite D2-145, Bee Cave, TX (512) 263-3610 Customers are important to the staff at Backwoods Austin. They are knowledgeable and helpful and will help you find exactly what it is you are looking for in pursuit of your next great outdoor adventure.